When you factor in California’s rising high cost of electricity and record low solar prices, going solar in CA just makes sense. In fact, CA is the state most suited for solar power in the U.S. The cost of a PV (solar photovoltaic) system depends on the overall size of the system, how many panels, inverters, permit costs, and installation labor costs. 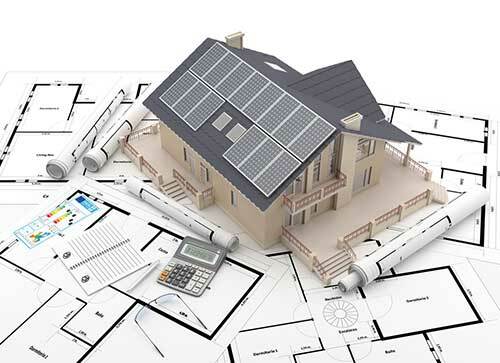 Several other factors can dictate prices, including if your home is new construction, the photovoltaic equipment manufacturer and where the system will be installed. MONEY SAVING TIP: California solar program rebates are declining, so the sooner you install your system, the greater your rebate and incentive will be. How Long Does It Take To Payoff Your Solar System? First, there is no standard answer here as every home and system are different. The answer depends on many factors. These include how many hours of sunshine your home receives each day, the cost of electricity, the price of solar panels, available tax credits, your system’s overall efficiency, and the portion of electricity needs you want to offset with solar power. Home Equity Loans – Home equity loans are a common method for homeowners to purchase solar systems and we have partnered with many lenders to help. Solar Lease and Power Purchase Agreements (PPA’s) – Contrary to popular belief, “purchasing” a solar system isn’t for everyone. If you are retired, on a fixed income, or don’t have much Federal Tax Liability then getting a PPA or Lease can be a great alternative to your electric bill. Large Finance companies not only own the system, but they subsidize their costs because they are able to receive the tax benefits. You get a fixed payment, a guaranteed production, and a large company that is responsible for the system for 20 years. Transferring is very easy to new homeowners, and there is no lien involved. Property Assessed Clean Energy (PACE) – Is an option for financing renewable energy improvements on private property. PACE programs allow local governments, state governments to fund the upfront cost of solar on residential and commercial properties, which are paid back paid as an addition to the owners’ property tax bills. This allows a property owner to implement improvements without a big up-front cash payment. Prepaid PPA – This option is also great for the homeowner that cannot get the Federal Tax Credit and does not want a monthly finance payment. By getting a Prepaid PPA, you are able to finance or pay cash for a solar system, and get an instant discount for the value of the Federal Tax Credit and not have to file for it. Flex Loan – A Flex Loan is a very popular way to purchase a solar system. Contact us for details. * Loans provided by EnerBank USA, Member FDIC, (1245 Brickyard Rd., Suite 600, Salt Lake City, UT 84106) on approved credit, for a limited time. Repayment term is 144 months. 2.99% fixed APR, effective as of September 2017. Minimum loan amounts apply. Actual loan term may be shorter if less than the full approved loan amount is used. The first monthly payment will be due 150 days from the date of application and monthly thereafter. ** Repayment term is 240 months. 5.99% fixed APR, effective as of September 2017. Minimum loan amounts apply. The first monthly payment will be due 30 days after the loan closes. Cash – This is always the easiest way to purchase, and will give you the fastest ROI. Typically you will see it in 5 – 7 Years, but faster if you factor in the rising cost of power from your electric bill. What Do Our Solar Customers Think? “The staff at CalState Solar communicate great, and thoroughly explain the program of your choosing. I never felt like I was “sold” a type of system, I was simply informed what the systems were, how they differed and what that meant for me. I have and will continue to recommend CalState Solar to my friends and family!